Below are answers to common technical questions of the “How do I…” variety. If you have general questions about LeaderAmp and how things work, please see our Leader FAQ page. What kind of mobile device do I need to use the LeaderAmp app? Any iPhone 5s or newer running iOS 1.3 or above. It is also important that you make sure that your mobile device is updated with the latest patches. Please work with your IT department if necessary. How do I download and install the LeaderAmp app? When you are added to the LeaderAmp system, you will receive an e-mail that has a 4-digit activation code and a link to download the LeaderAmp app from either the Google Play store (for android devices) or the Apple App store (for Apple devices). See the image to the right. Tap the appropriate download link and follow the store’s directions to install the app. When you first launch the app you will need to create an account. Follow the on-screen directions and use the 4-digit activation code sent in the e-mail. What if there is a software update to the LeaderAmp app? The app will automatically update itself if your mobile device allows automatic updates. Otherwise, it will notify you that an update is available and that it needs to be applied. Yes, you can install the app to multiple devices using the same download link and activation code you received in your initial Welcome to LeaderAmp e-mail. If you don’t have the welcome e-mail, you can search for “LeaderAmp” on the Apple App Store (Apple IOS devices) or the Google Play Store (Android devices) to download and install the app. 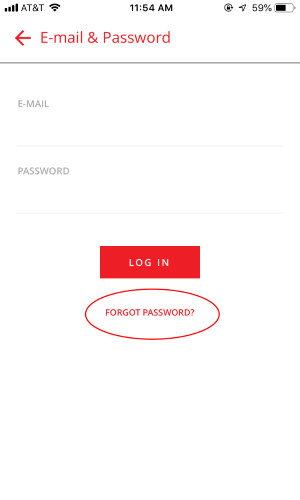 Then, on the Signup page, tap “Resend Activation Code” and provide the e-mail associated with your LeaderAmp account. This will send you an e-mail with instructions on how to reset your password. How do I change how often I get eCoaching suggestions and journaling prompts? How do I change on what days they occur? How do I upload a photo for my profile? Tap on the placeholder profile picture in the upper left-hand corner of the screen and use your device’s camera to take a picture. Note that you will need to grant the LeaderAmp app permission to access your device’s camera to do this. The photo you use will be visible to your Coach as well. How do I nominate a stakeholder to complete a 360 assessment? 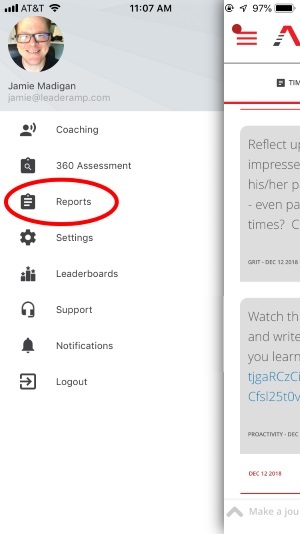 Tap the menu icon (3 horizontal bars) in the upper left-hand corner of the LeaderAmp app. 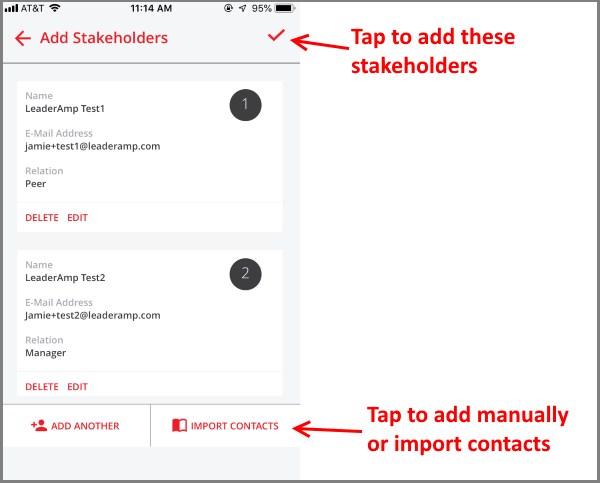 If importing contacts, tap the stakeholder from your contacts. This populates their name and e-mail, but you will still need to specify their relationship to you. This will add the person to a list. You will need to add more stakeholders until you have the minimum number required by your program. When you are done adding stakeholders to the list, tap the checkmark in the upper right-hand of the screen. On the next screen, you will see a draft of the e-mail that will be sent to the stakeholders. If you would like to edit the e-mail, just tap the message and edit. An e-mail will be sent to the stakeholders, prompting them to complete the 360 assessment. Can I customize the e-mail that goes out to stakeholders for the 360 assessments? Yes. After submitting the stakeholder’s name, e-mail, and relationship to you, there will be a screen with the text of the e-mail to be sent. Simply tap that screen to edit the contents of the e-mail. Can I go back later and nominate additional stakeholders for the 360 assessments? Tap the red “+” in the lower right corner to add more stakeholders. How can I tell which stakeholders have completed the 360 assessments? The screen will list stakeholders who have been nominated, along with the status of their request. Once the minimum number of stakeholders have completed the assessment, you will receive a notification in the app letting you know that this process is complete and that the 360 report is available for viewing. How do I select what leadership skills I want to develop at the start of my coaching engagement? First, the end of your self-assessment automatically takes you through the process of selecting a goal related to the dimensions measured by that assessment. Second, if your organization is using the 360 assessments as part of your coaching engagement, you will have an opportunity to select another goal from a different set of dimensions after your stakeholders complete that assessment. How do I change which leadership skills I want to practice after I have started an engagement? Once you select a goal based on an assessment, you are committed to practicing that leadership dimension and working towards that goal for the duration of your engagement. You cannot change mid-engagement. The length of an engagement varies depending on what your organization and/or coach has set up, but they are typically 3 to 6 months to allow enough time for practice and develop. How do I access my assessment reports? Note that your 360 stakeholder report will only be available once enough stakeholders have completed their ratings. How do I set new goals? Once a reassessment is complete, you will have the opportunity to select the same leadership dimension and practice it more (and possibly at a higher level) or you can select a new dimension to practice. But note that this is only if your organization is electing to extend your coaching engagement. Otherwise, your coaching engagement ends. How do I check to see where I stand on the leaderboards? The default Timeline page in the LeaderAmp app lets you easily start entries. Just tap the “Make a journal entry…” field at the bottom of the screen. Note that you can tap the ^ icon in this field at any time to expand or collapse the text entry field for easier use. If your phone allows speech-to-text dictation you can use it to complete journal entries or chat messages. Many find this more convenient than typing. When you’re done with your entry, just tap the send icon and you’re done. Thought of more to say? Simply start a new entry at any time. How will I know if I’ve improved on the dimensions I’ve been practicing? When the program is complete you will repeat assessments (both self and 360) on the dimensions you have been practicing. You will then receive a new report showing changes in your scores.